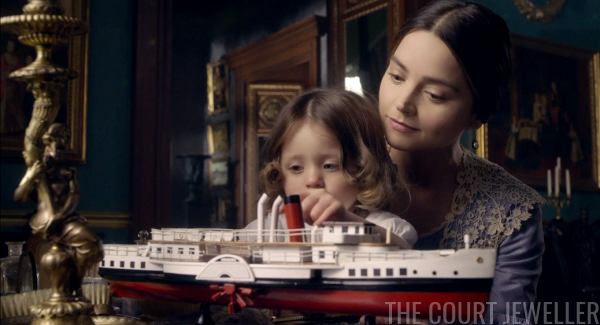 Wearing some of her little dangling earrings, Victoria shows little Vicky a model of the new royal yacht, the Victoria and Albert. 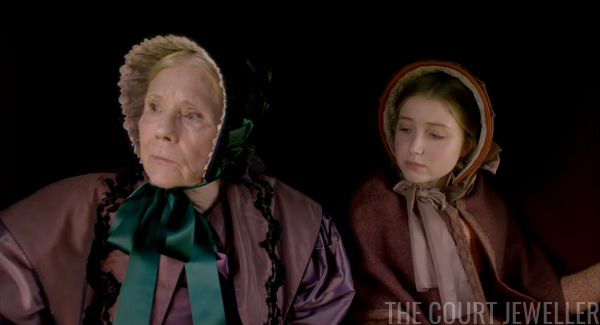 She suggests that they should go see Uncle Leopold in Belgium on the new ship. Albert, still smarting from last episode's revelations, overhears and scowls. But there's a more pressing destination on the docket. Peel shares that the Duke of Montpensier, youngest son of the French king, is courting the young Queen Isabella II of Spain. The Brits are nervous because King Louis Philippe of the French wants to set up an empire in Europe, linking various royal houses to his by marriage, and the Brits, fresh off the Napoleonic wars, don't like that idea at all. 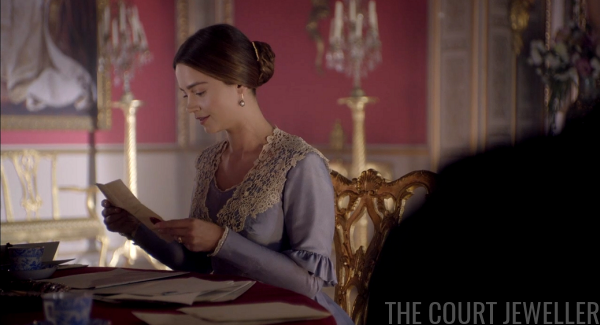 Against Peel's advice, Victoria decides to write Louis Philippe a letter suggesting that the Spanish marriage is a bad idea. 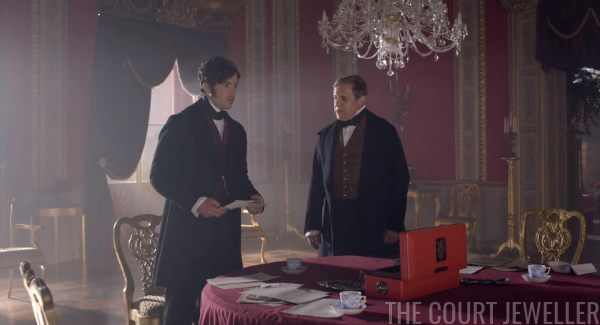 Albert tells Victoria that Peel thinks she should cool it with the letter writing. 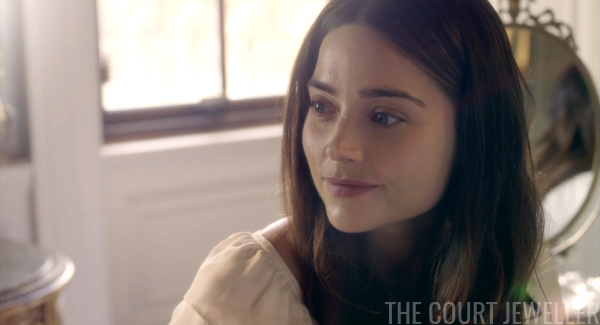 Victoria agrees -- she thinks they should go to France, so she can discuss the matter with Louis Philippe in person. 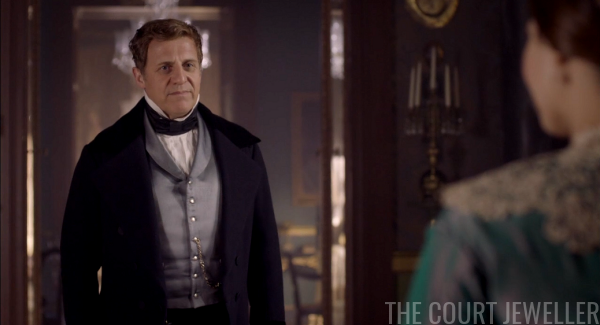 After the crossing, the party is greeted by Louis Philippe, who tells Victoria that she's a cute little monarch. Great start there, Louis. She loves being reminded that she's short! 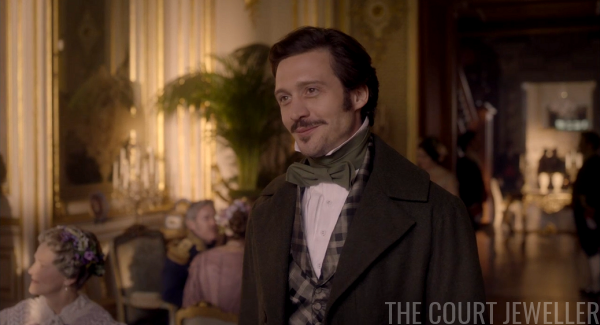 Louis Philippe, whose costuming appears to be inspired by his Winterhalter portrait, is accompanied by his youngest son, Antoine, who is the source of all this international matchmaking hullabaloo. 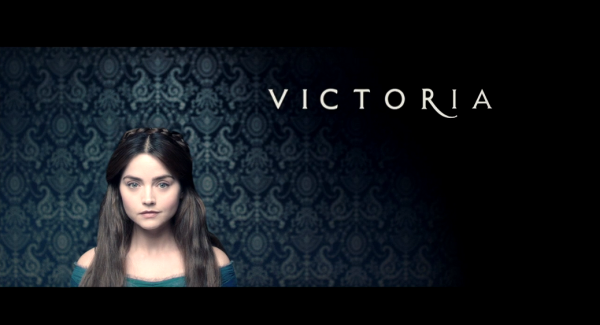 The French are clearly curious about Victoria, who really was the first English/British monarch to visit France since Henry VIII. Albert, ever the prude, isn't a fan of the fleshy paintings in the chateau. Louis Philippe introduces him to the "Duchesse du Barry," asking her to show him Renaissance paintings more to his taste. She appears to be fictional; there was no one in France with that title in 1843. The former Duchesse de Berry was still alive, but she had remarried to an Italian duke by that point. Clearly they're riffing on the famous Madame du Barry, mistress of King Louis XV, who was executed in the revolution. 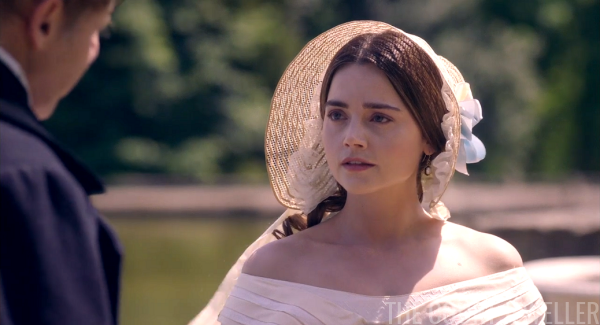 Victoria, who sensed that some of the French ladies were silently judging her fashion choices, asks her dresser to come up with an ensemble that's a little more chic for her next appearance. Surprise! Someone else has popped in for a visit with Louis Philippe: it's Ernst! He's tired of Coburg already. 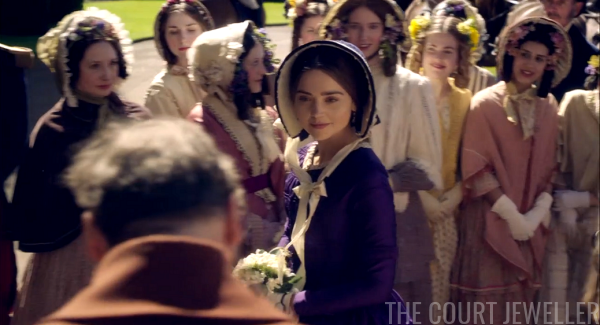 Victoria arrives for the grand banquet. There's a lot going on here! 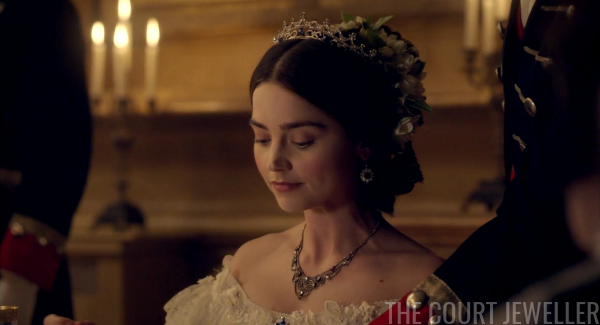 She's wearing the production's replica of the sapphire coronet, this time as a traditional tiara, plus the replica Albert Brooch and an invented necklace. 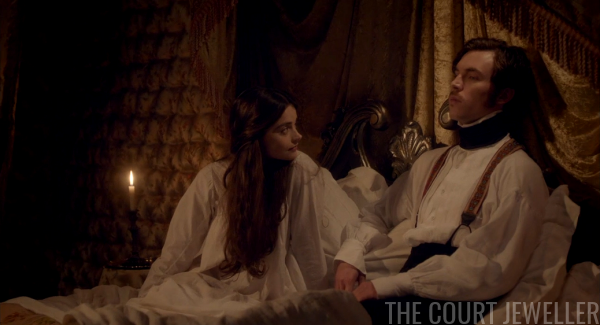 Her dresser has also taken some tips from the French servants at the chateau, and Victoria is wearing makeup. (Ooh la la!) Albert, typically, disapproves of "painted faces." 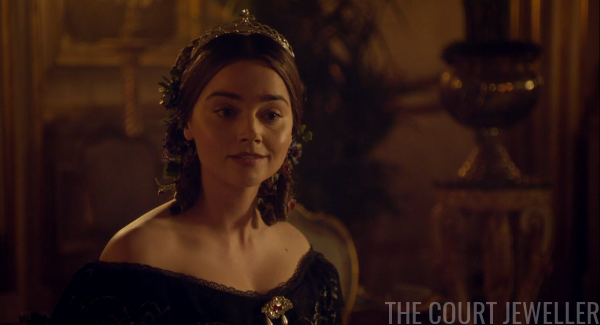 We get another good look at the replica tiara during dinner. (According to contemporary press reports, her glam appearance is exaggerated: "Her head dress was very plain, the hair being simply braided, and her jewels were handsome emeralds and diamonds.") 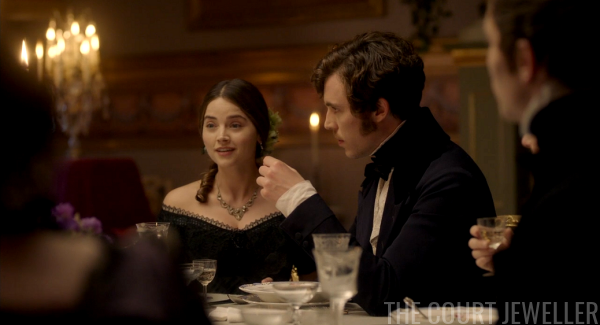 She tries to get Louis Philippe to chat about his matchmaking during the meal, but he refuses to mix business with pleasure. 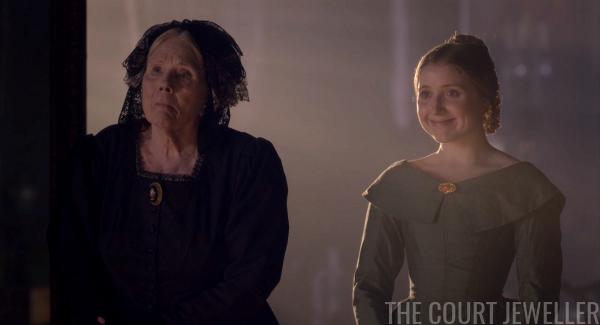 That evening, Victoria and Albert discuss the visit so far. He's beyond disgusted with the vulgarity of everyone and everything. He is heading for a full-on emotional breakdown. 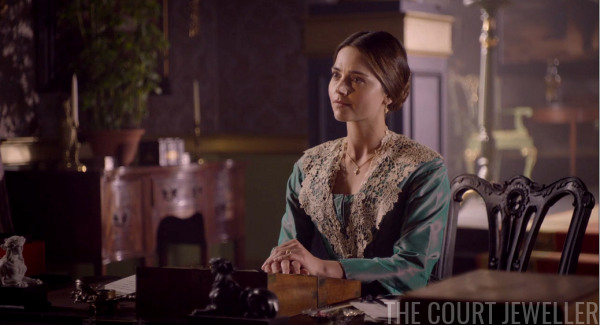 Victoria's disappointed that Albert is wasting time on being judgmental instead of getting to the bottom of the Spanish marriage problem. 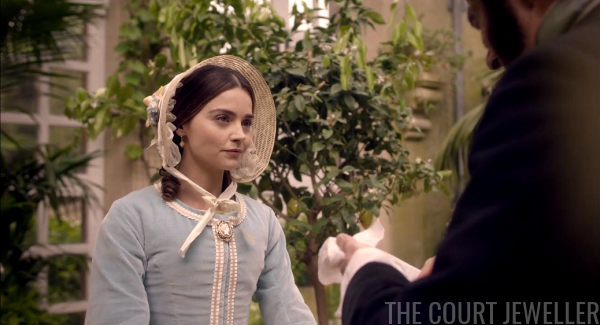 Victoria tours the chateau's kitchen gardens with Louis Philippe the next morning, where they chat about monarch things, like assassination attempts and patriotism. 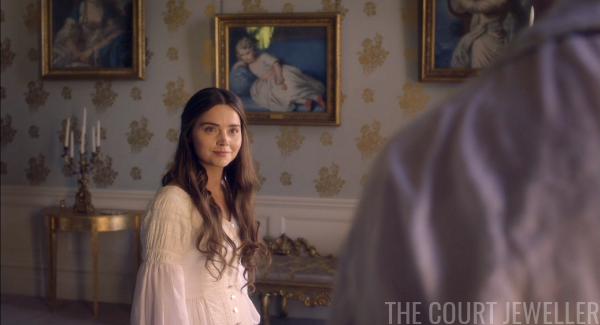 She tells him that a marriage between his son and the Queen of Spain would "upset the balance" between Britain and France. He says that an alliance between Spain and the Coburgs would be a problem, too. Wilhelmina, wearing her coral earrings, is in a mood, too -- she's finally realized that Ernst is an absolute hound, not a charming prince. 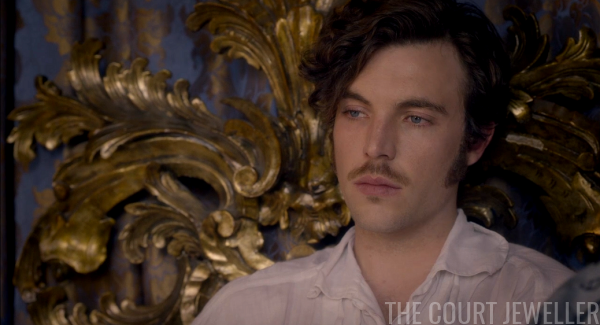 Victoria spies on her husband's skinny-dipping adventures, and she jokingly admonishes him for his loose morality when he returns to the chateau. And then, of course, canoodling ensues. Turns out Albert isn't totally averse to pleasure. 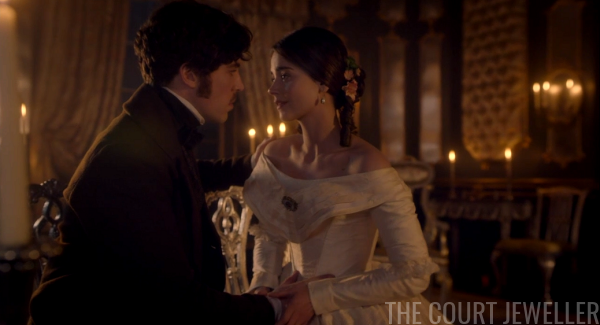 Later, we get a good view of Victoria's famous emerald serpent engagement ring. 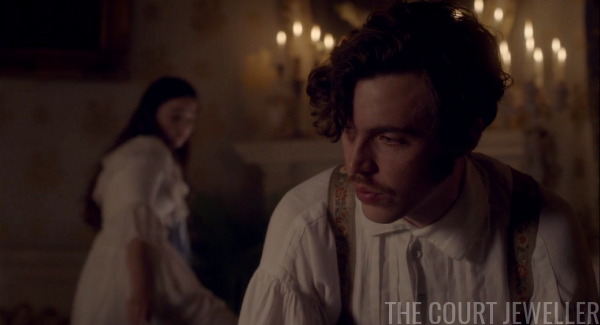 And Albert finally tells her what's been bothering him: the possibility that Uncle Leopold is really his father. 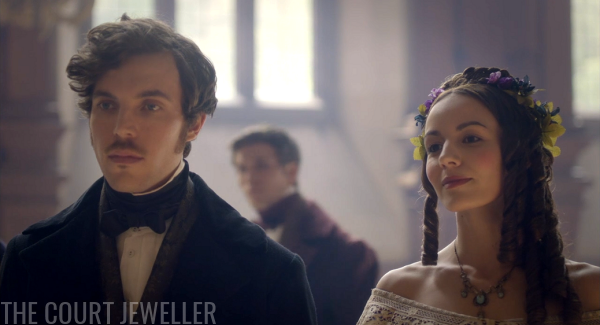 Victoria is shocked, but she quickly recovers, and tells Albert that it's no surprise that Leopold would want to believe he's Albert's father. Any man would want him as a son. She doesn't care who his father is. She loves him no matter what. 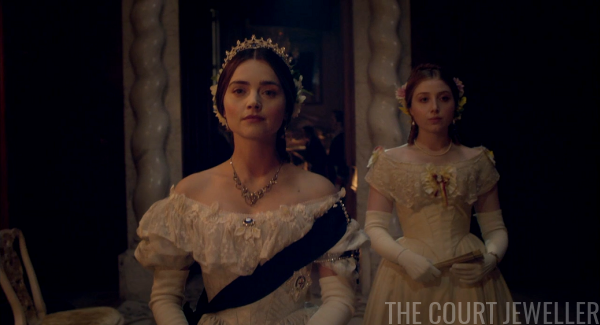 That night at dinner, Victoria wears one of the production's invented diamond tiaras and a brooch with pearl pendants. 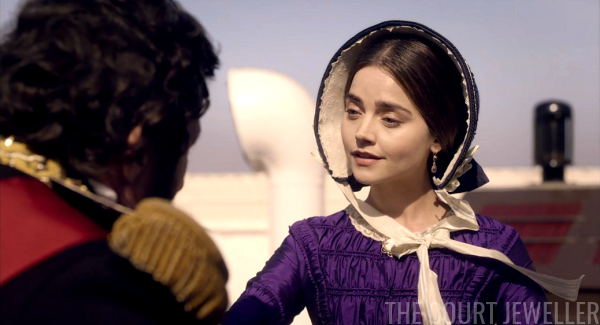 She gets down to business, telling Louis Philippe why the Spanish marriage is unacceptable to the Brits. 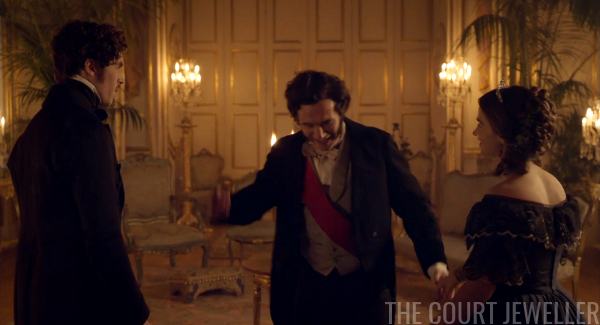 He says that the Coburg marriage for the Spanish queen is unacceptable to the French. 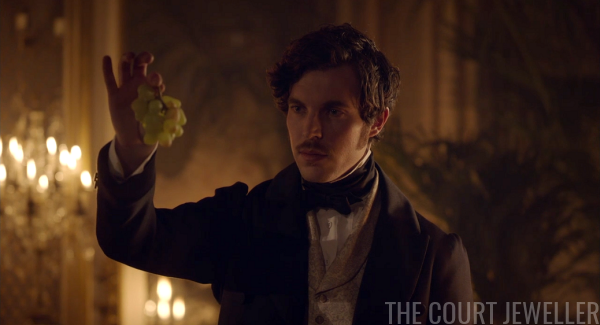 Albert steps in and offers an alternative solution, which he decides to illustrate using a bunch of grapes, for some reason. He thinks that both the French and the Brits should back off and do nothing regarding the Spanish marriage. 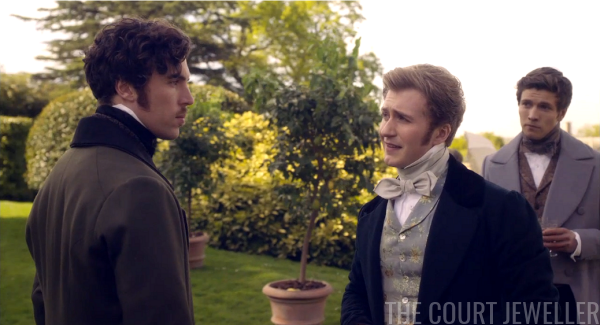 Okay, guys, here's what really happened with Louis Philippe and the Affair of the Spanish Marriages. In 1846, three years after this visit, the French and the British got involved with the Spanish government to try to broker a favorable political marriage for the sixteen-year-old Queen Isabella II. The Brits wanted Prince Leopold (not Ferdinand) of Saxe-Coburg and Gotha, Victoria and Albert's cousin. (I'm guessing the show didn't trust the viewers not to mix up the Leopolds?) The French wanted the Duke of Cadiz, one of Queen Isabella's Borbon cousins. The Duke of Cadiz won the day, and the diplomatic relationship between France and Britain was severely damaged. But there was an even more complicated wrinkle: because some people believed (rightly or wrongly) that the Duke of Cadiz was gay, there was a possibility that Isabella would not have any children. Louis Philippe engineered a marriage on the same day between his son, the Duke of Montpensier, and Isabella's younger sister, Infanta Luisa Fernanda, with the lingering possibility in the air that their children would one day inherit the Spanish throne. Joke was on them, though: Isabella ended up having nine children, though their paternity was often questioned. 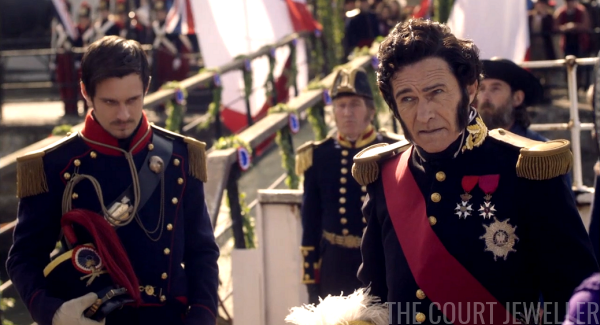 Also, Louis Philippe ended up losing his throne in 1848. C'est la vie. Back at Buckingham Palace, Vic 'n Al regale everyone with tales of their diplomatic triumph over dinner. Peel is pleased -- the last thing they need is another war with France. No spoilers for future episodes in the comments, please! Our next recap will be published next Monday afternoon.